The Green and Whites needed just two points from their final London 2 South East fixtures against Maidstone at the weekend to clinch a place in the play-off. And as they have done of late, they did it in emphatic style with a stunning 76-12 victory to secure second place in the league. That has set up a clash with Farnham, who finished second in London 2 South West, at Coolhurst in a winner-takes-all game as Horsham bid for promotion to the highest level in their history. 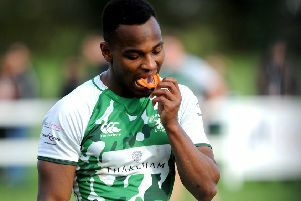 On Saturday, Declan Nwachukwu scored another hat-trick as Mike Watts and Sam Hampson put down a brace of tries along with scores from Aaron Linfield, Jonny Whiting, Giles Barber, Joe Wilde and Jordan Bell as the host ran riot. Stocker said: “Since December, following our loss away at Beckenham, we understood that we needed to win all our remaining games if we were to have a chance at a promotion play-off. “This included tough away assignments to Charlton Park, Deal and Old Colfeians as well as tricky encounters at home against the likes of Hayward’s Heath. The team have been in scintillating form. Ten wins on the trot with nine bonus points scoring 66 tries on the way speaks volumes. “It doesn’t, however, do justice to the effort levels every player in the squad has put in and on which this run of form has been built. “The consistency in availability and effort has allowed us to field strong teams despite injuries and test the squad throughout and eventually brought us to this position on the final day of the season. “Maidstone was another tricky assignment that needed managing to progress to next week and in all aspects of play, we were in control which ultimately meant for a comfortable win despite the early nerves. “Declan Nwachukwu won the man of the match award for another barnstorming performance with yet another hat trick and 35 for the season. Hampson calmed any early nerves with a comfortable try only one minute in, dashing in from out wide and utilising his trademark pace to score. Tom Johnson converted well in what would prove to be challenging conditions. Linfield then capitalised on a Maidstone mistake at the line out and dashed through from the halfway line. Nwachukwu then crossed soon after and Johnson converted for a 19-0 lead on just 16 minutes. A fine team try from a scrum was then finished off by Whiting and Giles put down soon after. With the conversion, Horsham led 31-0. There was just time before the break for Nwachukwu crossed for his second, which again was converted. In the second half, Bell’s crossfield kick was gathered by Watts in space, who scored and Johnson converted. Wilde was back to his intercepting ways as he dashes through, plucked out of the air and raced home for another converted try. Maidstone hit back following a good lineout and recycling move which enabled them to score to take it to 52-7 on 52 minutes. Four minutes later, Maidstone found the line again after a poor lineout from Horsham. That was the last of the Maidstone reply as Watts, Johnson, Hampson and Nwachukwu completed the free-scoring show. Horsham: Barber, Fairs, Cass, Osgood, Goward, Smith, Everitt, Whiting, Linfield, J.Bell,Nwachukwu, Johnson, Wilde, Hampson, Watts. Subs: N.Bell, Tredgett, Condon.